Held in its unyielding clutch he released himself from death, and a horrible death at that. To make sure eyewitnesses would see that the his formerly occupied burial niche was empty, he tossed aside the two-ton stone sealing off the opening allowing them to enter. It all happened in a flash that left veteran guards paralyzed with fear and shaking in their boots. It was one of those displays of raw power and uncontestable strength as a dead man came back to life. The last enemy standing is often the last standing because it is the nastiest, or the strongest, or the most clever, or the one with the greatest survival instincts, able to dodge the blows and outmaneuver the adversary. Death is that kind of enemy. It is the “last enemy to be destroyed,” according to 1 Corinthians 15:26, the last enemy standing. And what an enemy it is. Death has bested every human being that ever lived and it still is at an astonishing rate of more than 150,000 per day. Sometimes it comes with great violence and forewarning, and other times it simply sneaks in quietly and does its dirty work. There is no place on Earth able to hold death at bay. None can resist it. The longest survivor was a character named Methuselah. It took death 969 years to beat him, but it did. Death conquered Samson, one of the strongest men to ever live. Death felled a giant named Goliath. Decades later it defeated the mighty warrior-king David. The wisest man who ever lived was Solomon, but he didn’t outsmart death. Death has taken down the godly and the ungodly. It even did its deed to Jesus, more viciously than it had ever been toward anyone else. However, when death took on Jesus, it wasn’t ready for the counter-stroke. Death struck Jesus on the cross and laid Him in a tomb, like it had done thousands and millions of times before. But this time it was different. This time someone struck back. That had never happened before. This time the firm, cold, unrelenting grasp of death was peeled back and its victim was freed. He defeated death. Finally, someone stood up to death and beat it at its own game — death beat death. Finally someone proved himself stronger, and when he did, he didn’t just defeat death. He didn’t just capture death. He destroyed it! (1 Cor. 15:26). Death, the greatest, the strongest, the most unrelenting enemy of mankind was defeated. What amazing strength it took. It took God-strength and in the end, the last man standing was not death, but Jesus. In Philippians 3:10 Paul expresses his desire to know the power of Christ’s resurrection. It’s not a desire to know about it, but for this resurrection power to be the power operating in his own life. Leonard Ravenhill writes that “Calvary expresses the love of God. The resurrection explains the power of God.” This is the standard power that is active in the life of the believer. The strength that destroyed death is coursing through my life. Sound impossible? Defeating death was impossible, too, but Jesus did it, and in doing it he made possible our own victories. If this strength can destroy death, it can handle any of the matters just cited. The sooner I exercise the strength given to me through the power of Christ’s resurrection, which is an exercise of obedient faith, the stronger I’ll be in ways that actually matter. 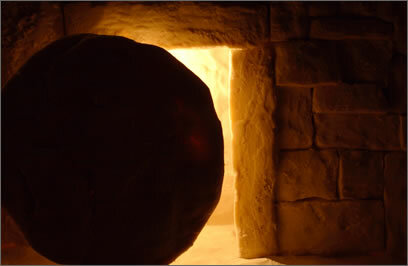 Today I’ve been letting the empty tomb remind me of of just how awesomely strong Jesus is. It makes my “But I can’t” sound like what it really is — unacceptable pathetic whining. This entry was posted in Uncategorized and tagged 1 corinthians 15, Christian Living, Christianity, death, Easter, Gospel, Jesus Christ, last enemy, power, resurrection of Christ, strength. Bookmark the permalink.